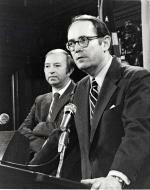 In September, 1978, U.S. Deputy Secretary of Energy John O'Leary spoke at the dedication of Pennsylvania's newest nuclear power plant. Referring to the new reactor as a "scintillating success," O'Leary concluded "that nuclear power is a bright and shining option for this country." Three Mile Island Cooling Towers, Middletown, PA, March 28, 1979. O'Leary's views were understandable. The nation, in the midst of an energy crisis caused by foreign oil production cuts and embargoes, was desperate to find alternative sources of power that would pollute less than the wood, coal and oil upon which the nation had so long relied. Six months later, Three Mile Island's Unit Two would be the site of the nation's most serious nuclear accident. Early on the morning of March 29, 1979, a malfunction in the cooling system started a chain of events that quickly spiraled into a near catastrophe. At about 4:00 that morning, an automatic valve in the plant's Unit Two closed, shutting off the water supply used to cool the reactor core. The reactor automatically shut down as required, but a series of equipment and procedural errors in the following hours caused the core to become partially exposed. With insufficient coolant, the core temperature spiked, causing a 52-percent meltdown and producing a dangerous bubble of hydrogen gas. To prevent the gas pressure from rupturing the concrete reactor shell, engineers vented gas into a containment tank and added coolant to lower the core temperature to acceptable levels. While the engineers struggled to regain control of the reactor, Metropolitan Edison, the utility that operated the plant, withheld information from the media and delayed notifying some public officials. As the authorities and news media worked to piece together a cohesive story from the scattered and often contradictory reports, many feared for their lives. On March 30, Pennsylvania Governor Richard Thornburgh advised all pregnant women and preschoolers living within five miles of the plant to evacuate, and all others to remain indoors. As award-winning scientists warned about the dangers, between 80,000 and 200,000 residents voluntarily evacuated. Schools remained closed for the next week and a half. Metropolitan Edison averted a total meltdown, and officials reported that citizens were exposed to less than 100 millirems of radiation after the accident, a dose about the equivalent of four chest x-rays. The American nuclear power industry, however, would never be the same. While life began to return to normal by mid-April, the accident produced a dramatic shift in national nuclear policy, a temporary moratorium on the licensing of new reactors, and the canceling or more than 120 reactor orders. Since 2000, nuclear power has experienced a resurgence of interest and government support. Between 2007 and February 2009, seventeen license applications were submitted for the construction of twenty-six new nuclear following several regulatory initiatives that prepared the way for new orders. J. Samuel Walker, Three Mile Island: A Nuclear Crisis in Historical Perspective (Berkeley: University of California Press, 2006).